ChiIL Mama will be checkin' out the show tonight, and we'll have a full review for you. “Dixie’s Tupperware Party,” the hilarious show starring Dixie Longate which turned Off-Broadway into a Tupperware-mania celebration and garnered the prestigious 2008 Drama Desk Award Nomination rolls into the Royal George Theatre Cabaret (1641 North Halsted, Chicago) for a limited eight-week engagement beginning March 18th through May 15th, 2011. Written by Kris Andersson, the production is playing in Chicago as part of a 20-city national tour. “Dixie’s Tupperware Party” stars Dixie Longate, as the fast-talking Tupperware Lady, who has packed up her catalogues and left her children in an Alabama trailer park to journey across America. 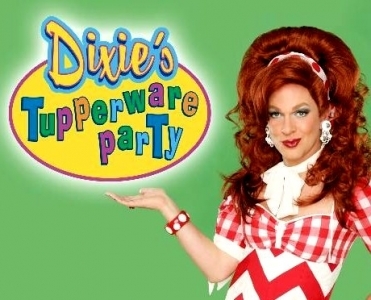 Critics and audiences have howled with laughter as Dixie throws a good ol’ fashioned Tupperware Party filled with outrageously funny tales, heartfelt accounts, FREE giveaways, audience participation and the most fabulous assortment of Tupperware ever sold on a theater stage! Loaded with the most up-to-date products available for purchase, Longate will share how she became the number one Tupperware seller in the world, as she educates her guests on the many alternative uses she has discovered for her plastic products. The performance schedule is as follows: Tuesday through Thursday at 7:30 p.m., Friday at 8 p.m., Saturday at 3 p.m. and 8 p.m. and Sunday at 3 p.m.
Tickets for “Dixie’s Tupperware Party” go on sale Wednesday, Jan. 12, 2011 at the Royal George Box Office (312) 988-9000, Ticketmaster.com or you can call Ticketmaster at (800)982-2787. Tickets are also available at all Ticketmaster retail locations (including select Carson Pirie Scott, Coconuts and fye stores). Ticket prices are $44 for the weekday performances and $49 for the weekend performances. For groups of 10 or more, please contact Group Theatre Tickets at www.grouptheatertix.com or call (312) 423.6612.